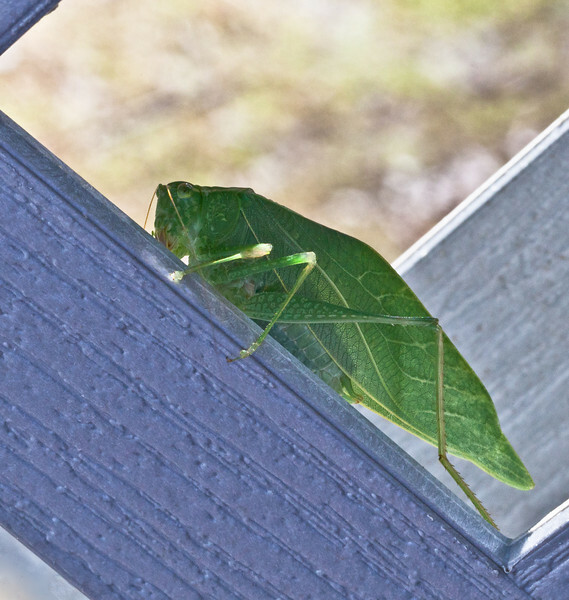 August 4, 2011- A True Katydid - Pterophylla camellifolia. Found this guy on the lattice which is part of my deck. He was hiding in between two pieces of lattice work. Posting very late today. (216:365) Posting very late today, as my Mom is leaving tomorrow so she is keeping me busy until she leaves. I used to have a lot more energy but lately as I had said before the chemo is really zapping my energy levels...C'est la vie. Agree with Brian! Also like the contrasting blues & greens. Wonderful shot - looks like a leaf with legs! Great macro. Stay strong, we all love you. Lovely graphic quality. Wonderful shot! Nice capture, and I like the lines and comp! Good eye to spot your little friend! love the comp! Nicely done.